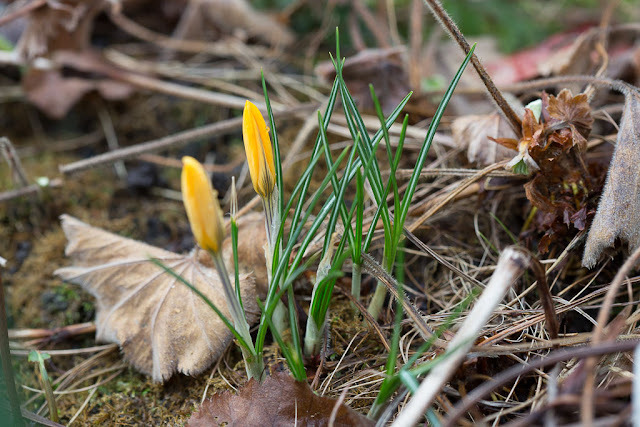 Our butter-colored crocuses are coming up in the flower bed by the back door, adding some color to the otherwise sere wintry landscape. Olga and I saw purple ones on our walks Saturday and yesterday. It's nice to see the world coming back to life! We also cleaned off our bookshelves, which were loaded down with stuff we are simply not going to read again. I've got two bags of books to go to the Oxfam shop. 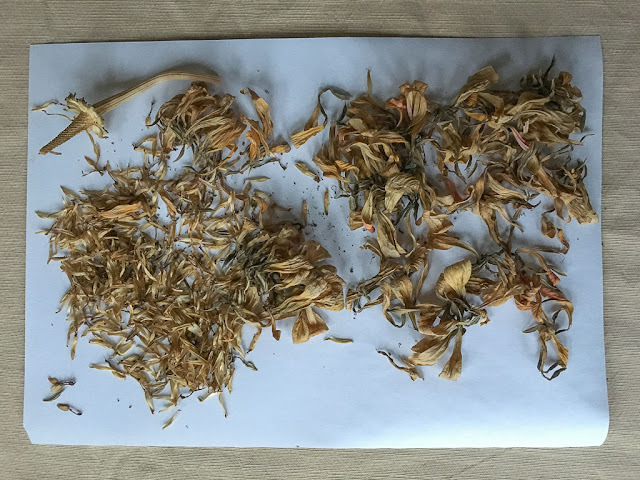 I also harvested seeds from a zinnia that I saved from last year -- one of the weird, streaky flowers. This is what I started with. 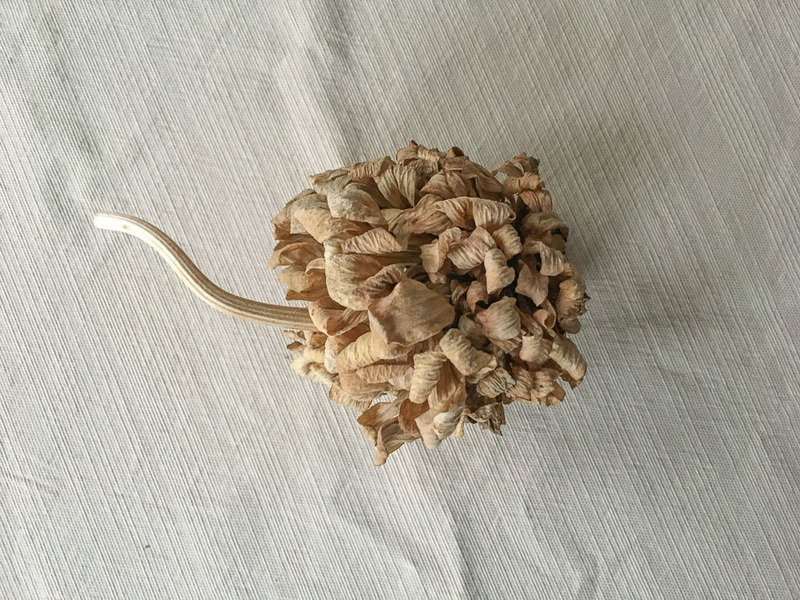 It's been decorating our end table all autumn and winter (despite the fact that I have an absolute phobia about dried flowers). 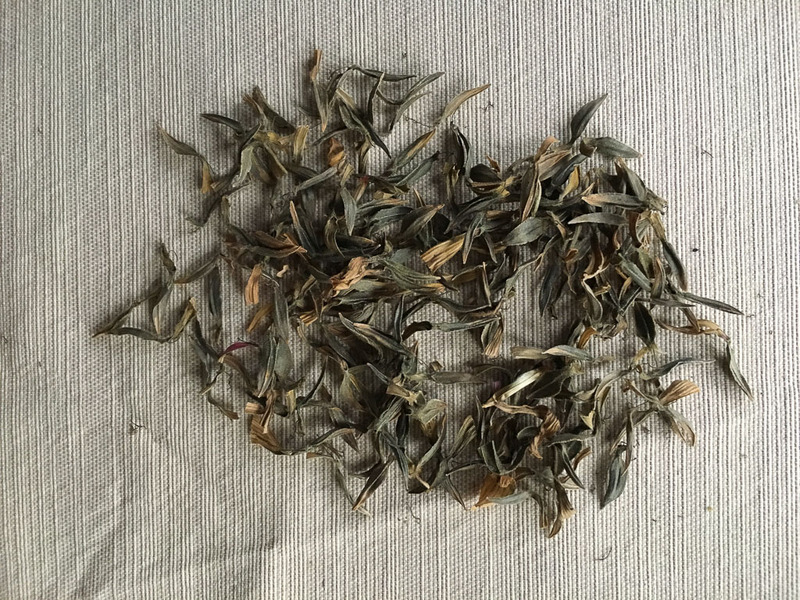 I pulled the blossom apart and was left with a crazy amount of material -- and no obvious seeds. So then I had to Google "where are a zinnia's seeds?" It turns out they're the small, dark arrow-shaped bits at the end of these petals. I suspected they might be seeds -- I remember from planting last year's seed pack that zinnia seeds are very funky-looking. This is what I wound up with. I have no idea whether they'll grow. 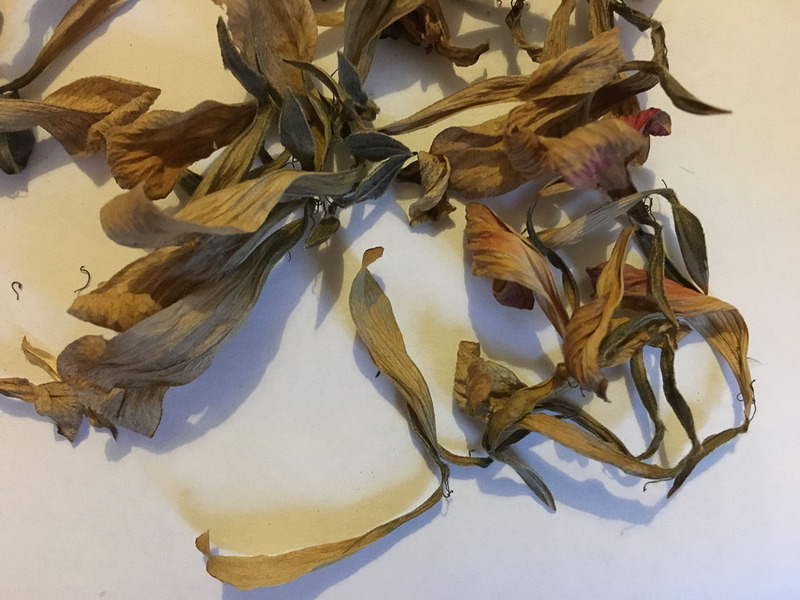 They seem very dry, even withered, and I'm not sure the flower was fertile. But I'll give it a go. Overall, I have a ridiculous quantity of seeds to deal with this year -- things I collected last fall from our garden or in the wild. Besides the zinnia I have sweet pea, honesty, burdock, cow parsley, foxglove, field poppy and something I think is hollyhock but I'm not sure. I've ordered compartmented seed trays from Amazon so I can start them on the windowsill in a few weeks. We'll see what grows! With all those seeds you should think about preparing a rough seed bed when out on one of your walks. You could scatter poppy seeds and suchlike and see what happens. By the way, "sere" is a lovely word...I must admit that I have probably never used it myself. I love watching you become more and more interested in growing things. And I can't wait to see if those zinnias sprout. Domesticity is an admirable trait, growing things, keeping things in order, chucking things- I wish there was a vitamin for that. Curious to see how well your seeds do. Olga is such a good little girl, her sister from another mother in Portland is the same, sweet, enthusiastic - a love pup. She is so gentle- a dog attacked her, caused some sorry damage and she did not even fight back. So much for the pit bull myth of aggression! I haven't grown anything from see since I was a kid. I'll be curious to see what you get. if you picked the flower while it was still fresh, the seeds may not sprout. if you plucked it after it was dried up and brown then they should. and this reminds me, I need to get my zinnia seeds. It will be interesting and enlightening to watch what happens with these seeds. I've been surprised by what will sprout and grow with good soil, water, and attention. Good luck with it! You are a literal whirlwind of activity. Meantime, I spent time on the computer, reading the New York Times, dozing a bit, watching t.v. and eating. Ho-hum. I did a few domestic chores this weekend, but otherwise was my usual slug self (church lady duties notwithstanding). Can't wait to see what happens with all your flowers! One of the things we talked about at our church council meeting yesterday was the possibility of creating wildflower spaces to cut down on our mowing. I am always impressed by your clearing and collecting instincts! That seed business is all over our house at the moment, I am allowed to shake paper bags with something in it but otherwise stay well away from it as the window sills are filling with small pots. I love this time of the year. This is so exciting. I'm delighted you are saving seeds, and I look forward to seeing what grows. A good house cleaning does more than clean the place...it makes you feel better! Incredible photos! They almost look like abstract art! 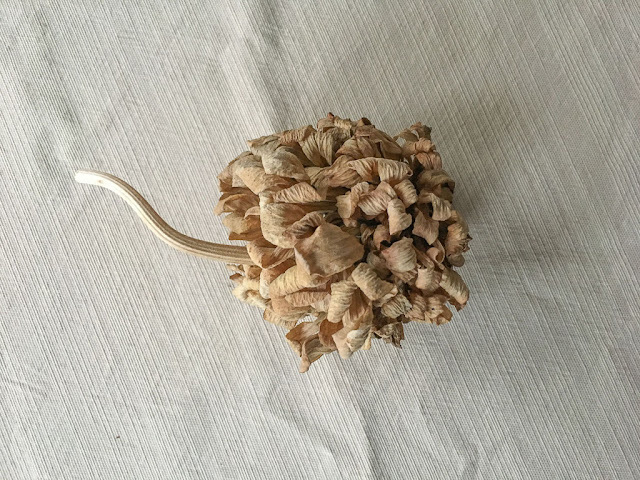 You have a phobia about dried flowers -- like, in a feng shui way? Tell us more. I love zinnias so much, especially the giant ones. They're just so WOW. I collect the dried heads, like you do, but I don't separate the seeds out. I just crush the whole kit'n'kaboodle in my fist and scatter it all onto the soil, and mix it up a little with a finger. Works like the dickens. Here, it's soon time to start seeds indoors if one's going to. Nothing gets transplanted outdoors till after the long weekend in May (Victoria Day) or, if one's smart and patient, after the second weekend in June. Nasty windstorms and late frosts have decimated my seedlings and bedding plants more than once, and every year I swear I'll wait ... wait ... wait ... but it's so hard to!